A pet shop is a place where dogs, cats, birds, rabbits, reptiles, rodents, fish, and other animals not born and raised on those premises are kept for the purpose of sale to the public. While many people are very satisfied with the pets they acquire from pet stores, critics of pet stores argue that there are numerous problems with the way most stores acquire, care for, and sell animals. 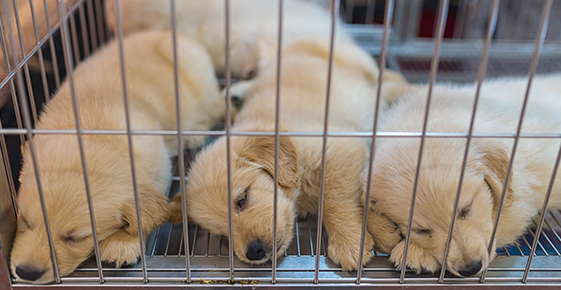 Many stores acquire most or all of their stock from large-scale commercial breeding operations that may also supply animals to industries that pet store patrons could find morally objectionable (such as cosmetics testing). Though not all of these facilities breed dogs, most are essentially the equivalent of puppy mills for other species. Overcrowded cages and long, stressful journeys via air or truck can cause the spread of disease, resulting in sick animals arriving in the store. Critics of pet stores argue that there are numerous problems with the way most stores acquire, care for, and sell animals. Large pet store chains frequently house sick animals in plain view with their other stock. Store employees are sometimes inappropriately educated in the handling of animals; picking up fancy rats by their tails, for example, is a common pet shop practice even though it is known to be painful to the animal. Due to the nature of the store environment, animals are not usually properly socialized by the time they are sold to their new owner. This can result in frustration for the owner and even the eventual abandonment of the pet. Some pet stores have a screening system and attempt to counsel or interview potential pet owners. Reputable stores may refuse to sell a pet to someone who appears irresponsible or otherwise unable to care for the pet they wish to buy. However, most stores do not abide by this policy, and even reputable stores may mistakenly sell pets into homes where they will be abused or abandoned. Many animals are purchased on impulse (especially as pets for children); these animals suffer when the novelty of the new pet wears off.